Chancellor of the Exchequer George Osborne displays the red budget box to the media on March 18 before delivering his budget statement to Parliament. Chancellors usually carry their speeches in the box. Carrying on a U.K. tradition, Chancellor of the Exchequer George Osborne displays the red budget box to the media on March 18 before delivering his annual budget statement to the House of Commons. Chancellors usually carry their speech in the box. Curiosity piqued when the U.K. general election is mentioned, you lean forward just a little. But then you hear a term you don’t understand, frown and think that you’ll never be able to understand the mess that is British politics right now. Don’t worry — I’m here to help. I’ll decrypt the jargon, explain the basics and give you a breakneck tour of our main political parties. Ashcroft, Michael: A major British pollster — and it’s actually Lord Ashcroft, thank you very much (don’t worry, I explain what a lord is farther down). There’s very little regional polling data in the U.K., a fact that has made elections there hard to predict in the past, but Ashcroft has helped change that by conducting political polls in more than 100 constituencies since 2010. Although he’s an avowed Conservative himself, Ashcroft claims his polls are impartial. And most people agree, including us; data from his polls has gone into the general election predictions featured on our site. Ballot papers for the 2010 general election. Ballot: This piece of paper contains information only about the electoral district where voters are registered. Voters put a cross next to their preferred local candidate, most of whom represent a political party. The candidate with the most votes wins that seat in Parliament. The ballot paper doesn’t have any information about national candidates — the leaders are chosen ahead of the election by their parties. By-election: When a seat in Parliament becomes vacant between general elections (often because the incumbent has either resigned, defected to another party or died), a by-election is held. There have been 21 by-elections since the last general election in 2010. Cabinet: The prime minister selects 21 of the most senior members of government to make up the Cabinet. Cabinets coordinate the work of various government departments and decide on policy together. Unlike debates in the House of Commons, Cabinet meetings are private, and Cabinet members are not supposed to disclose what takes place in them. Coalition: A government formed of more than one party. After the Conservatives failed to gain enough seats on May 6, 2010, to form a government on their own, they formed a coalition government with the Liberal Democrats on May 11, 2010. It was the first time that Britain had experienced a coalition government since Winston Churchill’s war ministry, which ended in 1945. Based on our current projections, there is about a 90 percent probability that no single party will have enough seats for a majority government. That means the party with the most seats will need to form a coalition or try to rule as a minority government. Conservatives: Although it can trace its roots back to the 17th century (making it the oldest political party in Europe), the modern Conservative Party was founded in 1834 and is one of Britain’s two largest political parties. Led by the current prime minister, David Cameron, the party is right of center; lower taxation is a consistent strand of its policy. Traditionally, the party was associated with the aristocracy and landowners. But it managed to gain the support of the middle class and, more recently, supporters across British economic groups. Unlike in the U.S., Brits associate the color blue with the political right and red with the political left. Historically, that can be explained by the rise of red being used by socialists in France, leaving the Conservatives to reconsider their red, blue and white color scheme (chosen because of the British flag). In recent years, the Conservatives have sought to soften their image by using a slightly paler shade of blue and incorporating green to underline their environmental policies. In 2006, the party replaced its logo of a hand holding a torch with a drawing of a tree. (This makeover was ill-received; the new design was described as something between “a bunch of broccoli” and “the coin scratch on a lottery card.”) You can read more about the Conservative Party’s current policies or about its history. Constituency: The U.K. is carved up into 650 electoral districts called constituencies, each of which is represented by one member of Parliament. There are 533 constituencies in England, 59 constituencies in Scotland, 40 in Wales and 18 in Northern Ireland. Every eight to 12 years, boundary commissioners review the size of those constituencies to ensure that political representation is fair. Currently, each member of Parliament represents a constituency with an electorate of between 57,000 and 72,000 people. But geographically, they vary quite a bit. The largest constituency is Ross, Skye and Lochaber in the north of Scotland, measuring about 12,000 square kilometers. The smallest is Islington North in London, which is just 7.35 square kilometers. People who live in a constituency are known as constituents. Constitution: Unlike in the U.S., there is no written constitution in the U.K. As a result, history counts a great deal — the U.K. “constitution” is just the accumulation of decisions and practices over time. Democratic Unionist Party (DUP): Founded in 1971, the DUP is the largest party in Northern Ireland and currently the fourth-largest party in the House of Commons, with eight seats. The party was founded by Ian Paisley, who also established the Free Presbyterian Church of Ulster. Members are unionist and want to “strengthen” Northern Ireland’s relationship within the U.K.
Dissolution of Parliament: This isn’t just when Parliament stops handling business (that’s called a prorogation); it’s the official term for when Parliament ceases to exist altogether ahead of a general election. Members of Parliament have to leave their seats in the House of Commons and have only a few days to clear out their offices before they become members of the public. Or if they haven’t had enough of politics, they can stand again as candidates in their constituencies. Under the new Fixed-term Parliaments Act, a Parliament is dissolved 25 working days before the general election (this year, that’s March 30). Larry is the official 10 Downing Street cat. Downing Street: The British, understated equivalent of the White House, although it’s more of a kibbutz-type affair. The prime minister’s official residence is at No. 10 Downing Street while 11 Downing Street has been the home of the chancellor of the Exchequer and No. 12 has been where the prime minister’s press and communications offices can be found. The chief whip (which isn’t as strange as it sounds — see below) lives at No. 9. Finance: Political finances in the U.K. are regulated by the Electoral Commission, which sets limits on how much a party can spend while campaigning, ensures that spending is recorded (and, where necessary, audited), and publishes the information as public record. During the long campaign (which began Dec. 18) the precandidacy spending limit was £30,700 (about $45,700). During the short campaign (which starts March 30), an official candidate can spend £8,700. In addition to those limits, during both the long and short campaign, candidates can spend an additional 9p (about 13 cents) per voter in county constituencies and 6p per voter in borough seats. All these rules are relatively new — before 2001, parties could spend however much they wanted. First past the post: This is just another way of describing our winner-takes-all voting system, in which the candidate with the most votes takes the seat. In the U.K., as in other places that use first-past-the-post, voters may complain about feeling that their vote is “wasted,” which in turn can lead to tactical voting (i.e., voting for a candidate who has a realistic chance of winning rather than a favorite candidate). General election: This is when members of the U.K. electorate decide who will represent them in Parliament. Since the Fixed-term Parliaments Act was passed in 2011, each parliament serves a fixed term. That means that from this election forward, the U.K. will vote on the first Thursday in May of the fifth year after the last election was held. I have no idea why it’s known as a general, rather than a national, election. Greens: In 1972, a group of friends gathered at a pub near Daventry and founded Britain’s first political party to focus on environmental policies: The PEOPLE party. It didn’t last long under that name, though, and was succeeded by the Ecology Party in 1975, which in turn was succeeded by the Green Party in 1985. Since 1990, the Greens have existed as three separate parties: one in England and Wales and one each in Scotland and Northern Ireland. In 2010, the Green Party of England and Wales gained 1 percent of the national vote, giving it one seat — its first in the House of Commons. In the upcoming election, it is currently predicted to keep that seat, in Brighton Pavilion, but gain no more. House of Commons: The House of Commons is the lower of the two houses of Parliament, but don’t let that fool you — the Commons is where new laws are debated and agreed upon by the 650 MPs who sit on the green couches there. The simplest way to approximate the role of the Commons is to imagine that the House of Representatives had the power to overrule Senate objections by majority vote, to select the president and the Cabinet from its own ranks, and to vote the president and the Cabinet out of office. House of Lords: This is where Lord Ashcroft can be found when he’s not doing polls. In many ways, it’s like the House of Commons — it too is a body of Parliament that can introduce legislation, and its members can become government ministers. 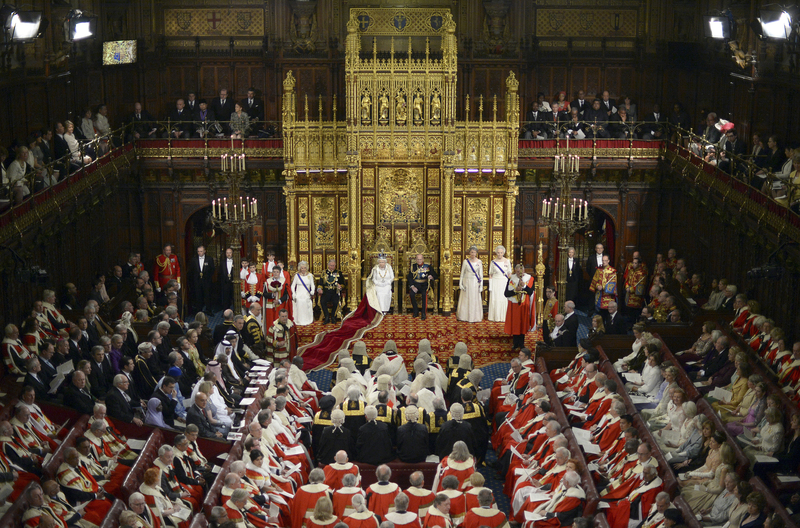 Unlike the Commons, however, the approximately 790 members of the House of Lords are appointed, rather than elected. An independent body, the House of Lords Appointments Commission, makes recommendations about who should be appointed and vets nominations (which can come from either the public or political parties). Once appointments have been approved by the prime minister, they’re formalized by the queen. Another key difference is that members of the House of Lords sit on red couches rather than green couches. That is key. Queen Elizabeth II prepares to deliver her speech in the House of Lords during the State Opening of Parliament in 2014. Hung parliament: A parliament where no single political party has over half of the seats in the House of Commons. This tends to lead to instability because it’s hard for any party to get enough votes to pass legislation. Kate Middleton: You’re on the wrong website. Labour: The British Labour Party can trace its origins to 1893, when a Scottish miner who was also an MP set up a socialist society known as the Independent Labour Party. Its logo was red right from the start — influenced perhaps by the red flag used by republicans and socialists in the 1848 French revolution. By 1900, the Trade Union Congress had set up the Labour Representation Committee with the goal of supporting working-class candidates in elections. Although the party has continued its strong ties with trade unions (15 unions are currently affiliated), written manifestos haven’t contained the term “socialism” since 1992. After 18 years out of power, Labour won a landslide victory in 1997, having reinvented themselves as “New Labour” under the leadership of Tony Blair, who shifted the party toward the center. In 2010, Labour lost 94 seats and along with them control of government. The party, currently led by Ed Miliband, is now forecast to win around a third of the vote and about 280 seats. Liberal Democrats: This party was born after the Liberal Party (founded in 1859) and the Social Democratic Party (founded in 1981) formally merged in 1988. Traditionally perceived as Britain’s centrist party, the “Lib Dems” once played a key role in creating Britain’s modern public welfare system. The party’s current logo, which depicts a flying “bird of liberty,” was adopted in 1989. In the 2005 national election, the Liberal Democrats picked up 62 seats. Nick Clegg became leader in 2007 and aimed to modernize the party. In 2010, the party won 57 seats and entered into a coalition government with the Conservatives. Although they’ve been Britain’s third-largest party for decades, the Liberal Democrats are expected to suffer big losses in the 2015 election and are currently forecast to win only about 25 seats. Majority government: When a government is formed by a party that has an absolute majority of seats in the House of Commons — at the moment, that requires 326 seats. (The current coalition between the Conservatives and the Liberal Democrats is considered a majority government because together the two parties hold 358 seats.) A majority government doesn’t appear to be a likely outcome of the 2015 election, though — the forecast currently points to only about a 10 percent chance that any party will win enough seats to govern alone. Marginal seats: The battleground of a political election are the so-called marginal seats. These are the places where only a few percentage points stand between the front-runners and their competition, so the seat could easily “fall” or change hands. Voters in these seats are known as “floating” or “swing” voters. In 2010, there were 194 seats where the swing (i.e., the fraction of votes needed for the outcome to have been different) was 5 percentage points or less. Based on current polling, it looks like this election will also be a close fight in many parts of the U.K. (to be more precise, in 102 constituencies, there are 5 percentage points or less between the two leading parties). Member of Parliament (MP): MPs sit in the House of Commons, where they propose and consider new laws, speak up about issues and can ask government ministers questions. There are 650 MPs in total, one for each of the U.K.’s 650 constituencies. 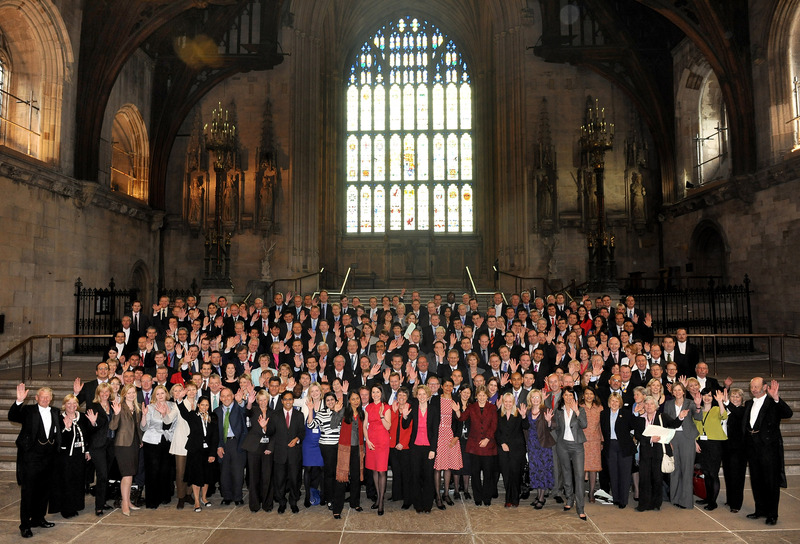 The majority of the 232 new MPs elected in the 2010 general election. Minister: The government is made up of 121 ministers who either come from the House of Commons or the House of Lords. Most are in charge of a specific government department — for example, the minister in charge of the Department of Health is known as the secretary of state for health (or often, more simply, as the health minister). The four most senior positions in British politics are known as great offices of state; they are the prime minister, chancellor of the Exchequer, foreign secretary and home secretary. The chancellor of the Exchequer is the finance minister who heads up the Treasury and is responsible for preparing and presenting the government budget. The foreign secretary handles British relations with foreign countries, as well as business with the Commonwealth of Nations and the overseas territories. The home secretary handles all internal affairs for England and Wales. Minority government: When no party, or coalition of parties, has the 326 seats required to form a majority government, there might be a minority government. If a minority government can’t get the support of other parties in the House of Commons to get legislation passed, it can be ousted by a vote of no confidence (see below). Given that there is currently about a 90 percent probability that no party will have enough seats to form a majority government after this election, it looks likely that the next five years of government in the U.K. will either be a Conservative minority government, a Labour minority government or some coalition of one of those parties and the others. Parliament: Made up of three parts (the crown, the House of Commons and the House of Lords), this is where laws are made. Plaid Cymru: Pronounced “plied come-ree” the name (appropriately enough) means “the Party of Wales” in Welsh. It was founded in 1925 but didn’t win its first seat in the House of Commons until 1966. In 2010, Plaid Cymru gained 11 percent of the vote in Wales, winning three of the 40 seats there. The logo of the party is the yellow Welsh poppy. Prime minister: The leader of the country, the leader of the government and, typically, the leader of the party that has won the most seats in the election. Queen: Currently Elizabeth II, who represents the crown. She doesn’t get to vote, but she does get to play a big constitutional role. The queen opens and dissolves Parliament and ultimately is the last stop before legislation is passed (this practice is known as “royal assent,” although these days it’s virtually unthinkable that she’d ever say no to anything). Scottish National Party (SNP): Formed in 1934 out of a formal merger between the National Party of Scotland (formed in 1928) and the Scottish Party (formed in 1932), the SNP was initially plagued by internal disputes while pursuing its goal of making Scotland an independent state. The left-of-center party is represented by a logo that combines the Saltire (Scotland’s flag) and the thistle (Scotland’s flower) — the sign is nicknamed “the clootie dumpling,” which is also a national dish. After 45 percent of Scottish voters said in September that they wanted independence, 2015 looks like it will herald the largest success in SNP history. For the past 40 years, the party hasn’t managed to gain more than six seats, but in this election, it is expected to wipe out Labour support in Scotland and is now projected to win most of the 59 seats there. Although the party isn’t running for election anywhere outside of Scotland, those historic results would be felt in Westminster — with the party leapfrogging the Liberal Democrats to become Britain’s third-largest. It’s not yet clear what the SNP would do with its newfound power in British politics. Labour has ruled out a formal coalition with the SNP, and the SNP has ruled out a formal coalition with the Conservatives. Alex Salmond, who led the party for 20 years before 2014, said recently that the SNP would vote against the Conservatives if they attempted to form a minority government, effectively ousting them from power. Shadow Cabinet: Leading members of the country’s second-largest party form a cabinet that “shadows” their opposition. Their role is to closely scrutinize the work of government and wait in the wings until the next general election. Social Democratic and Labour Party (SDLP): Founded in 1970, the SDLP was formed when several MPs and former MPs came together to form their own party in Northern Ireland. The SDLP is an Irish nationalist party and advocates for more power to be devolved from Westminster to the Northern Ireland Assembly. The party is currently forecast to win three seats in the 2015 election, the same number it has won in every election since 2001. The logo of the party is intended to underline its commitment to a united Ireland — it also evokes the image of a shamrock. Speaker: The speaker is the only MP who ceases to be involved in party politics. He or she is chosen by a secret ballot, after which he or she sits in the House of Commons to chair debates — a role that largely consists of shouting “Order! Order!” when the parties scream at each other too much. Political impartiality is obviously key here, and yet something fascinating could happen this year. With Conservatives and Labour neck and neck in the polling, if the two parties were to win the same number of seats, the current speaker might resign and reclaim his allegiance to the Conservatives to tip the balance. It’s always been a slightly unpopular role — between 1394 and 1535, seven speakers were beheaded. Thursday: Since 1935, national elections have taken place on Thursdays. Up until 2011, that was just a matter of convention, rather than law. One theory claims the tradition began because people used to be paid on Fridays, so voting on a Thursday was a good way to ensure that they weren’t too drunk (or, as we would say, “pissed”) to cast their ballots. Another theory claims that letting voters decide on a Thursday gave a new government enough time over the weekend to get its act together before starting work the following Monday. Tories: These days, the Conservatives are often referred to as the Tories (it’s a nickname that’s neither affectionate nor insulting), but technically speaking, the Tories were dissolved in the 1830s and succeeded by what we now know as the Conservative Party. UKIP: Founded in 1993, the U.K. Independence Party is the most right-wing party to have seats in Parliament. The party has gained support from an increasingly Euroskeptic British electorate largely by campaigning on a single issue: withdrawal from the European Union. Its policies have also managed to draw in a large number of Conservative politicians who have defected toward the party. Led by Nigel Farage since 2004, UKIP currently has two seats in Parliament, both gained in by-election wins in the past year. It is currently projected to win around 10 percent of the vote in May’s election; that would be the highest share it has ever received. However, because support for the party is spread out geographically, those votes are expected to translate into two seats at most. Uniform national swing: This is a type of calculation that has been used for decades to predict how a party’s share of the national vote will translate into the number of seats it will have in the House of Commons. It’s now considered quite dated and quite useless. See, swing assumes that changes will be consistent in each constituency, but the actual dynamics of each electoral district can vary a lot. With better constituency-level data, election forecasters have become less reliant on uniform swing. Vote of confidence: Votes of confidence in a government’s ability to govern are pretty rare, but it’s quite possible that another one would happen after this election, especially if there’s a minority government. If a government loses a vote of confidence, then another confidence motion has to be called within 14 days. If government loses that second confidence motion, then a general election has to be called. Westminster: A shorthand term that refers to British government and/or Parliament, used because both can be found in the Palace of Westminster. When you hear people refer to “Westminster,” it has much the same connotation as when people refer to “Washington” — it just means power. Whip: A strange, though not wholly irrelevant word, that’s used to describe the individuals who are responsible for maintaining party discipline. Whips, who are either MPs or members of the House of Lords, are appointed to make sure that the maximum number of party members show up to vote and that they vote the way the party wants. Each week, whips send out a note (the document is also called the whip) that describes upcoming business where the party line will be important. If the item on the agenda is underlined once, it’s a little important. If it’s underlined twice, it’s quite important. If a matter is considered so important that it’s underlined three times, then it’s very serious, and if an MP defies the instruction, she could be expelled from her party and have to spend the rest of her time in Parliament sitting as an independent. When the majority in government is small or when there’s a minority government (both future situations that look possible right now), then party discipline is even more important and so are the whips. CORRECTION (April 1, 10:52 a.m.): An earlier version of this article mischaracterized the Social Democratic and Labour Party’s position on whether Northern Ireland should remain a part of the United Kingdom. SDLP is an Irish nationalist party and advocates Irish unification, not political union between Northern Ireland and Great Britain.